Mumbai’s real estate market is booming with a number of residential projects these days. Yet, finding the perfect apartment is not as easy as it may seem. 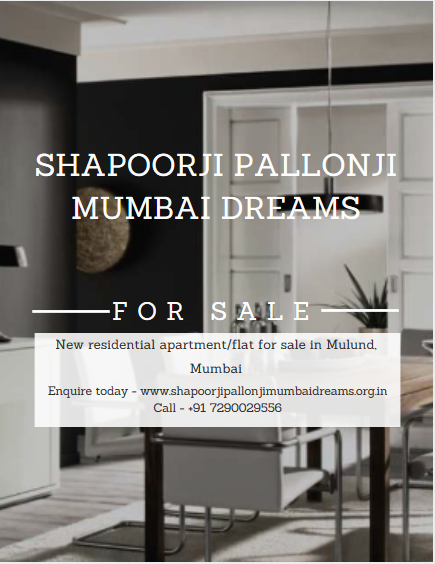 Shapoorji Pallonji Mumbai Dreams is a vibrant high-rise residential project at Mulund, Mumbai by Shapoorji Pallonji that offers maximum features for you to live every moment of life to the fullest! Spread over a land of 3 acres, this high-rise development offers posh variants of 1BHK, 2BHK apartments that are high on luxury and designed to perfection! The apartment carpet areas start at 403 sq. ft. and go up to an amazing 578.63 sq. ft., providing plenty of space to meet all your requirements. Packed with the highest level of luxury, comfort and class, Shapoorji Pallonji Mumbai Dreams Mulund offers world-class internal and external features that will blow your mind! You will find apartments with vitrified flooring, fabulous modular kitchens with multiple provisions, wide balconies and windows, multiple safety features and more. The external amenities at this development include a clubhouse, meditation centre, swimming pool, jogging track, gym, multiple sports facilities and a play-area for kids, crèche, rock climbing wall and skating rink, multipurpose hall, book café, art corner, picnic event lawn, Wi-Fi working lounge, senior citizens’ park, wide open greens, board game zone, power back-up, fast lifts, car parking facility, vehicular drop off, landscape garden and incredible security with video surveillance. With so much to do, you and your family will spend less time in front of the TV and more time enjoying yourselves outside. Apart from this there is a swimming pool, kids’ play area, landscape garden, crèche, video security, reserved car parking, 24*7 security, jogging track, 24-hour power backup, a state-of-the-art club house, and much more. The developer has ensured that project offers excellent security for your piece of the mind. Mulund is an upcoming area of Mumbai and offers excellent connectivity with the city and surrounding areas. The area has a number of leading schools, universities, colleges, ATM’s, banks, hospitals, etc. For entertainment there are excellent restaurants, hotels, mall, and eateries in close vicinity of the project. 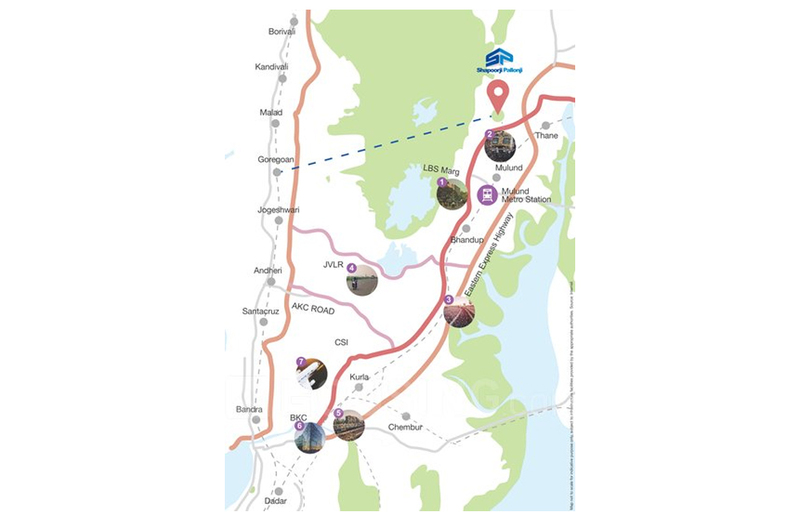 Located in Mulund, the project is connected to Mulund Airoli Road, and is just 2km from the Eastern Express Highway. The Thane Station is just 6.7 km from the project, Mulund Station is 3.9 km away and Nahur Station is 2.6 km away. Fortis Healthcare is just 6 minutes from the project. The Powai Business Centre is 20 minutes away. 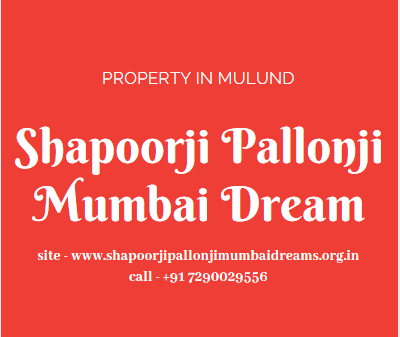 Starting at an unbeatable price of Rs.85.92 lakhs and moving up to Rs.1.21 Cr., the Shapoorji Pallonji Mumbai Dreams price is reasonable and worth every penny spent. This high-rise residential development offers you a great bargain that is very rare to find in Mumbai these days. You can also choose from different payment plans along with home loan facilities, NRI services and more. An opportunity to purchase your dream home in Mumbai awaits you, what are you waiting for? New launch in Mulund, Balrajeshwar Road Off LBS Marg. Multipurpose court & Skating Rink. Viviana Mall - 5.7 Km. Jupiter Hospital - 5.5 Km. Singhania School - 5.4 Km. Fortis Hospital - 4.0 m.
Platinum Hospital - 1.5 Km. R Mall - 1.0 Km. Mulund Railway Station - 2-3 Km. Eastern Express Highway - 2-3 Km. Inernational Airport - 21-22 Km.